Prairie Winds Quilt Collection - VHC Brands | P.C. Fallon Co.
Set the scene for true farmhouse style with the Prairie Winds and Kendra Stripe collection. The Prairie Winds quilt is a traditional block patchwork pattern updated for casual country appeal in colors of brick red, sage green, and khaki. The different fabrics include plaids, stripes, and a floral ditsy pattern. The quilt features stitch in the ditch and echo hand quilting. Machine pieced. Floral ditsy printed binding trims the edges. The reverse of the quilt is the printed floral ditsy fabric. 100% cotton shell and batting. Machine wash gentle. Do not tumble dry. Do not dry clean. The quilted shams are patchwork blocks like the quilt and reverse to the ditsy floral. The bedskirt and pillow cases are done in a sage green woven ticking stripe on a khaki background. Several choices of window treatments are offered in the sage green woven ticking stripe. Add height at the headboard with euro shams in either a sage and creme windowpane plaid or the woven ticking stripe. Personalize the ensemble with saying throw pillows or a patchwork pillow with a double ruffle. Carry the pattern into the bath with a patchwork shower curtain. These items are imported. 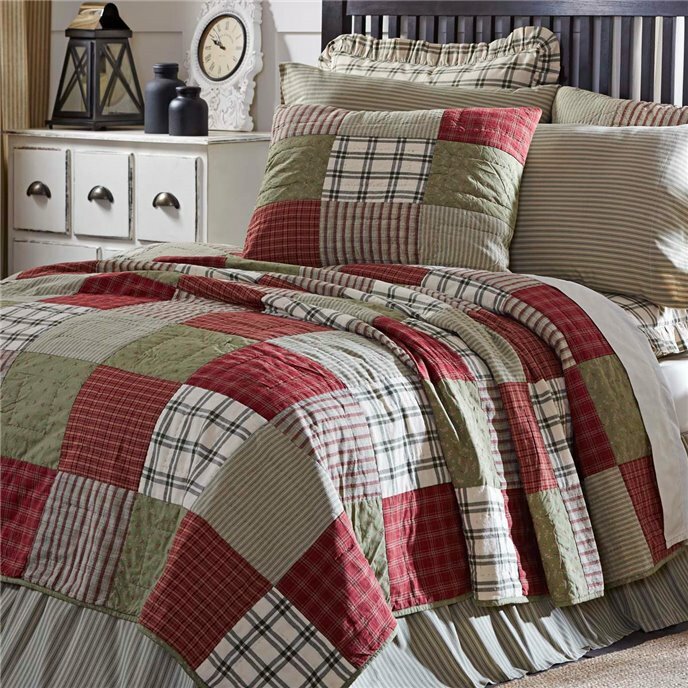 The Prairie Winds twin quilt is a traditional block patchwork pattern updated for casual country appeal in colors of brick red, sage green, and khaki. The different fabrics include plaids, stripes, and a floral ditsy pattern. Features stitch in the ditch and echo hand quilting. Machine pieced. Floral ditsy printed binding trims the edges. Reverse of the quilt is the printed floral ditsy fabric. 90"L x 70"W. 100% cotton shell and batting. Machine wash gentle. Do not tumble dry. Do not dry clean. This item is imported. Please note, colors may appear differently in different resolutions and on different computers. Manufacturer's UPC code is 840528162008. The Prairie Winds queen quilt is a traditional block patchwork pattern updated for casual country appeal in colors of brick red, sage green, and khaki. The different fabrics include plaids, stripes, and a floral ditsy pattern. Features stitch in the ditch and echo hand quilting. Machine pieced. Floral ditsy printed binding trims the edges. Reverse of the quilt is the printed floral ditsy fabric. 94"L x 94"W. 100% cotton shell and batting. Machine wash gentle. Do not tumble dry. Do not dry clean. This item is imported. Please note, colors may appear differently in different resolutions and on different computers. Manufacturer's UPC code is 840528161995. The Prairie Winds king quilt is a traditional block patchwork pattern updated for casual country appeal in colors of brick red, sage green, and khaki. The different fabrics include plaids, stripes, and a floral ditsy pattern. Features stitch in the ditch and echo hand quilting. Machine pieced. Floral ditsy printed binding trims the edges. Reverse of the quilt is the printed floral ditsy fabric. 97"L x 110"W. 100% cotton shell and batting. Machine wash gentle. Do not tumble dry. Do not dry clean. This item is imported. Please note, colors may appear differently in different resolutions and on different computers. Manufacturer's UPC code is 840528161988. The Prairie Winds luxury king quilt is a traditional block patchwork pattern updated for casual country appeal in colors of brick red, sage green, and khaki. The different fabrics include plaids, stripes, and a floral ditsy pattern. Features stitch in the ditch and echo hand quilting. Machine pieced. Floral ditsy printed binding trims the edges. Reverse of the quilt is the printed floral ditsy fabric. 105"L x 120"W. 100% cotton shell and batting. Machine wash gentle. Do not tumble dry. Do not dry clean. This item is imported. Please note, colors may appear differently in different resolutions and on different computers. Manufacturer's UPC code is 840528161971. The Prairie Winds Standard Sham is a traditional block patchwork pattern updated for casual country appeal in colors of brick red, sage green, and khaki. The different fabrics include plaids, stripes, and a floral ditsy pattern. Features stitch in the ditch and echo hand quilting. Machine pieced. Turned edge seam. The back of the sham is the printed floral ditsy fabric and has 3 dark wooden button closures with a 3" overlap. 27"L x 21"H. 100% cotton shell, 100% cotton batting. Machine wash, gentle. Tumble dry low. This item is imported. Please note, colors may appear differently in different resolutions and on different computers. Manufacturer's UPC code is 840528162039. The Prairie Winds King Sham is a traditional block patchwork pattern updated for casual country appeal in colors of brick red, sage green, and khaki. The different fabrics include plaids, stripes, and a floral ditsy pattern. Features stitch in the ditch and echo hand quilting. Machine pieced. Turned edge seam. The back of the sham is the printed floral ditsy fabric and has 3 dark wooden button closures with a 3" overlap. 37"L x 21"H. 100% cotton shell, 100% cotton batting. Machine wash, gentle. Tumble dry low. This item is imported. Please note, colors may appear differently in different resolutions and on different computers. Manufacturer's UPC code is 840528162022. The Prairie Winds Fabric Euro Sham is made of a sage and creme windowpane plaid fabric and is trimmed with a 2.5" gathered ruffle in the same fabric for extra farmhouse charm. The back of the sham is also the sage and creme windowpane plaid fabric and has 3 dark wooden button closures with a 3" overlap. This sham features a lightweight poly lining to keep your pillow from distorting shape and your pillow insert from showing through the open weave. 26"L x 26"H. 100% cotton. Machine wash, gentle. Do not tumble dry. This item is imported. Please note, colors may appear differently in different resolutions and on different computers. Manufacturer's UPC code is 840528162015. The Kendra Stripe Green twin bedskirt adds homespun appeal to any setting. The gathered bedskirt is a sage green woven ticking stripe on a khaki background. The deck is white cotton. 76"L x 39"W with a 16" drop. 100% cotton. Split corners. Machine wash cold, gentle cycle and tumble dry low. This item is imported. Please note, colors may appear differently in different resolutions and on different computers. Manufacturer's UPC code is 840528159602 . The Kendra Stripe Green queen bedskirt adds homespun appeal to any setting. The gathered bedskirt is a sage green woven ticking stripe on a khaki background. The deck is white cotton. 80"L x 60"W with a 16" drop. 100% cotton. Split corners. Machine wash cold, gentle cycle and tumble dry low. This item is imported. Please note, colors may appear differently in different resolutions and on different computers. Manufacturer's UPC code is 840528159596 . The Kendra Stripe Green king bedskirt adds homespun appeal to any setting. The gathered bedskirt is a sage green woven ticking stripe on a khaki background. The deck is white cotton. 80"L x 78"W with a 16" drop. 100% cotton. Split corners. Machine wash cold, gentle cycle and tumble dry low. This item is imported. Please note, colors may appear differently in different resolutions and on different computers. Manufacturer's UPC code is 840528159589. The Prairie Winds Blessed Pillow is made of a sage and khaki striped fabric with the word "blessed" embroidered in natural jute rope. The pillow is framed with a creme lace detail and trimmed with a natural burlap gathered ruffle. The back of the pillow is also the sage and khaki striped fabric and has 2 dark wooden button closures with a 3" overlap to conceal the pillow insert. 22"L x 14"H. Cotton and jute shell, 100% polyester fill. Shell hand wash, dry flat, fill spot clean only. This item is imported. Please note, colors may appear differently in different resolutions and on different computers. Manufacturer's UPC code is 840528162053. The Prairie Winds Home Pillow is made of a sage and khaki striped fabric with the word "home" embroidered in natural jute rope. Two appliqued hearts in a brick red plaid are outlined in natural jute rope. The pillow is also accented with four rows of creme lace. Turned edge seam. The back of the pillow is the sage and khaki striped fabric and has 2 dark wooden button closures with a 3" overlap to conceal the pillow insert. 22"L x 14"H. Cotton and jute shell, 100% polyester fill. Shell hand wash, dry flat, fill spot clean only. This item is imported. Please note, colors may appear differently in different resolutions and on different computers. Manufacturer's UPC code is 840528162060. The Prairie Winds Patchwork Pillow has 4 patchwork blocks in plaids and stripes in colors of brick red, sage green, and khaki framed by natural jute piping. The pillow is trimmed with a double ruffle in sage and khaki striped fabric. The back of the pillow is the sage and khaki striped fabric and has 2 dark wooden button closures with a 3" overlap to conceal the pillow insert. 18"L x 18"H. Cotton and jute shell, 100% polyester fill. Shell machine wash, gentle cycle, tumble dry low. Fill is spot clean only. This item is imported. Please note, colors may appear differently in different resolutions and on different computers. Manufacturer's UPC code is 840528162046. The Kendra Stripe Green Pillow Case set adds another layer of homespun appeal to your bed. The pillow case set is a sage green woven ticking stripe on a khaki background. There is a 4" trim of woven sage green ticking stripe fabric at the opening. Double sewn seams for extra durability. Set of 2 pillowcases, each 21"H x 30"L. 100% cotton. Machine wash, gentle. Tumble dry low. This item is imported. Please note, colors may appear differently in different resolutions and on different computers. Manufacturer's UPC code is 840528159626. Kendra Stripe Green Valance (16L x 72W) is a sage green woven ticking stripe on khaki. The valance is detailed with two rows of creme lace at the bottom with a 3" natural burlap gathered ruffle. Lined with white cotton. 100% cotton. 16" long including the 2" header by 72" wide. Features a 3.25" rod pocket. Machine wash, gentle. Tumble dry low. This item is imported. Please note, colors may appear differently in different resolutions and on different computers. Manufacturer's UPC code is 840528159510 . Kendra Stripe Green Swag set of 2 is a sage green woven ticking stripe on khaki. The swag is detailed with two rows of creme lace at the bottom with a 3" natural burlap gathered ruffle. Lined with white cotton. 100% cotton. Set includes 2 mirror image panels, each 36" long including the 2" header by 36" wide with a 16" center drop. Features a 3.25" rod pocket. Machine wash, gentle. Tumble dry low. This item is imported. Please note, colors may appear differently in different resolutions and on different computers. Manufacturer's UPC code is 840528159473. Kendra Stripe Green Valance (16L x 90W) is a sage green woven ticking stripe on khaki. The valance is detailed with two rows of creme lace at the bottom with a 3" natural burlap gathered ruffle. Lined with white cotton. 100% cotton. 16" long including the 2" header by 90" wide. Features a 3.25" rod pocket. Machine wash, gentle. Tumble dry low. This item is imported. Please note, colors may appear differently in different resolutions and on different computers. Manufacturer's UPC code is 840528159527 . Kendra Stripe Green Prairie Swag set of 2 is a sage green woven ticking stripe on khaki. Each panel is detailed with two rows of creme lace at the bottom with a 3" natural burlap gathered ruffle. Lined with white cotton. 100% cotton. Set includes 2 mirror image drawstring panels, each 36" long including the 2" header by 36" wide with an 18" center drop. Features a 3.25" rod pocket. Machine wash, gentle. Tumble dry low. This item is imported. Please note, colors may appear differently in different resolutions and on different computers. Manufacturer's UPC code is 840528159466 . Kendra Stripe Green Panel set of 2 is a sage green woven ticking stripe on khaki. The panel is detailed with two rows of creme lace at the top with a 3" natural burlap gathered ruffle, and this accent is repeated at the bottom of each panel. Lined with white cotton. 100% cotton. Set includes 2 panels, each 63" long including the 2" header by 36" wide. Features a 3.25" rod pocket. Includes 2 matching tie-backs. Machine wash, gentle. Tumble dry low. This item is imported. Please note, colors may appear differently in different resolutions and on different computers. Manufacturer's UPC code is 840528159442. Kendra Stripe Green Panel set of 2 is a sage green woven ticking stripe on khaki. The panel is detailed with two rows of creme lace at the top with a 3" natural burlap gathered ruffle, and this accent is repeated at the bottom of each panel. Lined with white cotton. 100% cotton. Set includes 2 panels, each 84" long including the 2" header by 40" wide. Features a 3.25" rod pocket. Includes 2 matching tie-backs. Machine wash, gentle. Tumble dry low. This item is imported. Please note, colors may appear differently in different resolutions and on different computers. Manufacturer's UPC code is 840528159435. Kendra Stripe Green tier set of 2 (24L x 36W) is a sage green woven ticking stripe on khaki. The panels are detailed with two rows of creme lace at the bottom with a 3" natural burlap gathered ruffle. Lined with white cotton. 100% cotton. Set includes 2 panels, each 24" long including the 2" header by 36" wide. Features a 3.25" rod pocket. Machine wash, gentle. Tumble dry low. This item is imported. Please note, colors may appear differently in different resolutions and on different computers. Manufacturer's UPC code is 840528159480. Kendra Stripe Green tier set of 2 (36L x 36W) is a sage green woven ticking stripe on khaki. The panels are detailed with two rows of creme lace at the bottom with a 3" natural burlap gathered ruffle. Lined with white cotton. 100% cotton. Set includes 2 panels, each 36" long including the 2" header by 36" wide. Features a 3.25" rod pocket. Machine wash, gentle. Tumble dry low. This item is imported. Please note, colors may appear differently in different resolutions and on different computers. Manufacturer's UPC code is 840528159497 . The Prairie Winds shower curtain is a traditional block patchwork pattern updated for casual country appeal in colors of brick red, sage green, and khaki. The different fabrics include plaids, stripes, and a floral ditsy pattern. Machine pieced. Features a natural burlap ruffle at the top and bottom of the curtain accented by 2 rows of creme lace. Hem fold. Lined with white cotton. 72"L x 72"W. 100% cotton. Machine wash gentle. Tumble dry. This item is imported. Please note, colors may appear differently in different resolutions and on different computers. Manufacturer's UPC code is 840528162077.